Waiting for the sunrise in the Penanjakan view point is the most preferred activity by travelers. The scenery of sunrise with the background of three charming mountains, covered with clouds, is truly amazing. Jeep cars will pick you up at the accommodation early in the morning to go up to the sunrise view point, then you will be taken across the desert and stop near Mount Batok. From here you walk and climb the stairs of Mount Bromo to see the crater. The view from the top of Mount Bromo is also very beautiful, from here you can see the vast desert, savanna and temples. After exploring Mount Bromo you return to the hotel by riding a Jeep again. Pick up at 07.30 am (depend of your hotel location) go to Probolinggo by Minibus with Air Con, it's take around 12 hours (if no traffic jam). You will be picked up from Ngadisari at 03.15 am or Cemoro Lawang at 03:30 am by JEEP to Penanjakan view point to see the sunrise. Leave Penanjakan at 06.30 am and go to Mt. Bromo by Jeep. The Jeep will be stopped at Parking area, walking to the Bromo caldera by your self. Leave Mt. 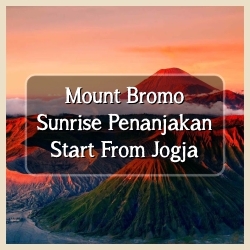 Bromo at 08.00 am by JEEP and back to your hotel in Cemoro Lawang or Ngadisari, having breakfast, rest, and also check out from the hotel. From Cemoro Lawang you will be picked up at 09.30 am and Ngadisari area at 09.45 am by a mini bus to go to Probolinggo office. Depart from Probolinggo at 11.30 am with a PUBLIC BUS to Denpasar (Mengwi bus station), Surabaya, Malang, Kalibaru, Surakarta, or back to Jogja. Almost Hotels in Bromo area do not have a good rating, please prepare yourself for this!